Women of all ages can be found cooing over the exhibition of wedding dresses from the eighteenth century up to the present day at the V&A. The one male visitor that I spied was immaculately dressed in a three piece Prince of Wales check suit complete with a tie pin and looked as if he might have been a mannequin come to life from one of the sets. In the eighteenth century white was just one of the colours that a bride might choose. Royal or rich brides favoured silk woven with gold or silver, whilst their less affluent sisters were apt to plump for something floral. Wedding dresses in this era were not worn just the once but became wardrobe staples no matter how wealthy you were. 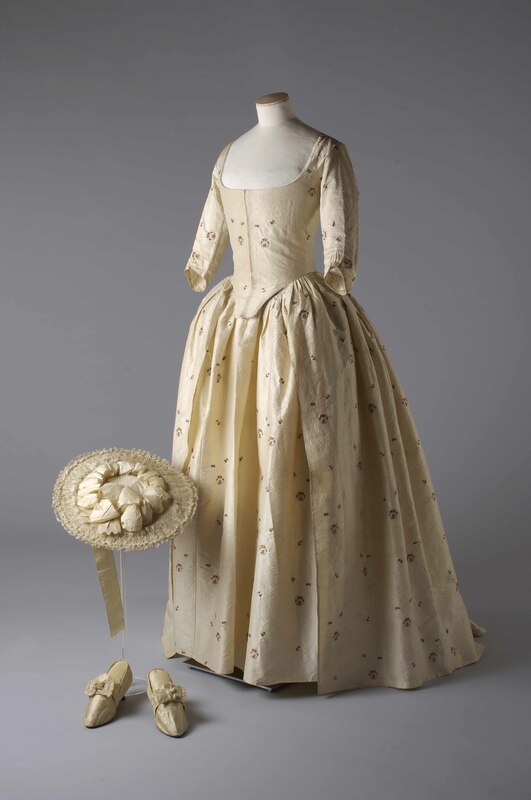 On show is a flower-sprigged silk dress worn by Jane Bailey when she married James Wickham in 1780; even though she was the daughter of a wealthy farmer, her dress, while fashionable, was not cutting edge. Image reproduced by kind permission of the Olive Matthews Collection, Chertsey Museum. White dress, veil and orange blossom became so popular in the Victorian era that it established itself as a tradition that has continued on until today. Queen Victoria married in a dress and veil adorned with Honiton lace which set a trend and ensured the survival of the lace trade in Devon. Men too got in on the act with fancy embroidered waistcoats often depicting Lilies of the Valley and Forget-me-Nots, both flowers associated with romance. As the century turned dresses became less formal but were still rarely dresses to be worn only once, even the very wealthy would have a dress that could be adapted for court presentation. Pride of place in the opening room goes to a Norman Hartnell dress worn when Margaret Whigham married Charles Sweeny in 1933 (the marriage failed and Margaret went on to be better known as Margaret, Duchess of Argyll). 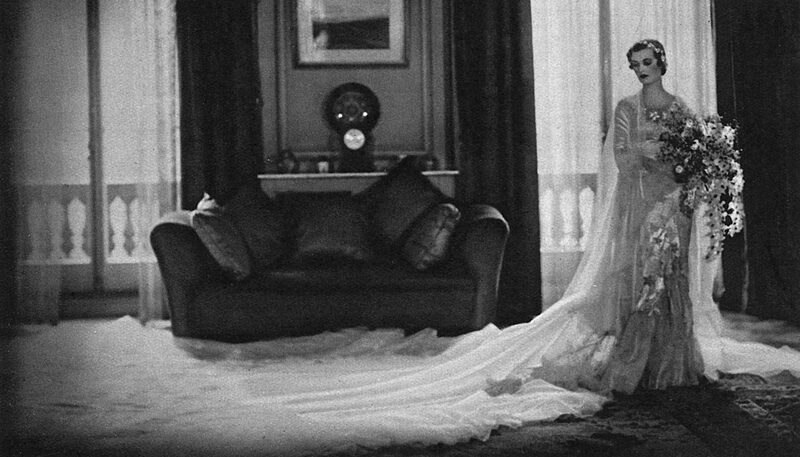 This was one of the first wedding dresses designed and made to be worn only once. What immediately catches the eye is the 18 foot satin train trimmed with silk tulle. The bias cut and embroidered gown took 30 seamstresses six weeks to make, it cost £52. Also on show is Pathe news film of the Bride and Groom emerging from the Brompton Oratory after the wedding ceremony. At the opposite end of the scale is a beautiful dress made during the austerity of the war years with rationing dictating its production. When Elizabeth King married in 1941 she didn’t have enough clothing ration coupons for a wedding dress. But upholstery fabric was not rationed. Buttercups strew the fabric making it look like heavy silk even though it was intended to cover a sofa. Upstairs the exhibition looks at wedding outfits from 1960 to the present day. Weddings take a step away from church, civil ceremonies come in and couples get older before they marry. All of these things make for a more diverse range of outfits. Brides are willing to spend so much on their dress that some designers like Christian Lacroix make 40per cent of their money from wedding gowns. The Duchess of Cornwall’s outfit that she wore for the blessing of her marriage to Prince Charles is on display: it is severely but beautifully tailored and in grey a million miles from the frothy merengues more traditionally associated with a wedding outfit. 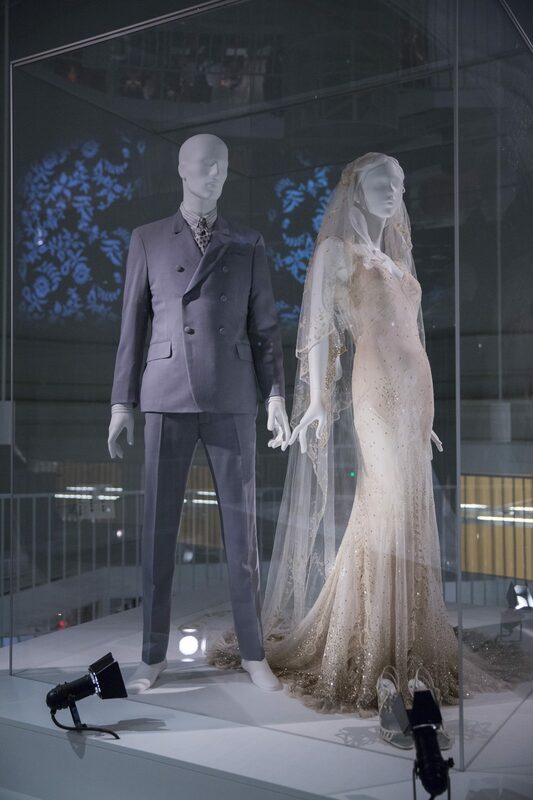 Most eye catching, on the mezzanine floor, is the John Galliano dress that Kate Moss wore when she married Jamie Hince. The bias cut dress took 701 hours to embroider; it is adorned with 270,000 gold sequins, 120,000 foil paillons and 2,800 pearl beads. Mr Hince wore a grey wool suit designed by Stefano Pilati for Yves St Laurent. It is stunning, if I were younger, richer, thinner and getting married it would be what I would want to wear. Most of the dresses on display have been worn and chosen by women on their ‘big day’, those have a short description of the people and their day. Those outfits that have been chosen and worn seem to have an extra dimension to them that those designed for a film to to end a designers fashion show don’t. The V&A has some of the most stunning dining rooms in London. The coffee is good and lunch tasty; if the weather is good drinks and snacks are available in the central courtyard and can be consumed in the sunshine.